How long until my order is shipped out? How long does it take for me to receive my order if I reside with the US? What shipping choices do I have? There is a problem with my order, what should I do? What if I need to cancel or return my order? Do you take checks or money-orders? Do you guys do gift wrapping? How can the gift wrapping options you have available? Do you do any type of engraving? Can I see examples of the types of engravings? What kind of music boxes do you carry? 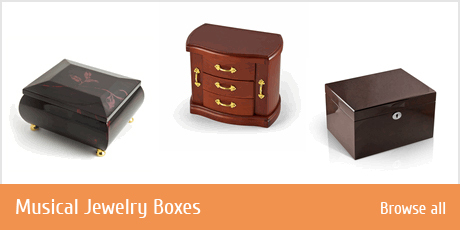 Do you carry jewelry boxes? What's the difference between a music box and a jewelry box? How do I know what song is in a particular box? Do you make custom boxes? Why are some boxes so expensive? Why don't all the boxes have the same music available? What types of songs do you have available? Can I sort by the type of music? What is a mechanical movement? What do you mean by notes? What is the difference between and 18 and 30 note? Can any music box have any size note inside? What musical movement manufacturers/brands do you have available? If I have my own box, can I send it to you to put the music in? Can I get any song not on your list? What type of music can the digital module play? Do you make custom mechanical movements? What does a conversion or converted tune mean? 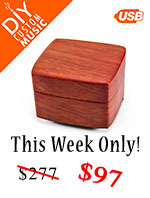 Should I choose the extra $75 option if my song is already in music box format? How do I send the sound file to you? Do you have a catalog you can mail out? Do you offer any coupon codes? Do you repair music boxes? Do you off any guarantees or warranties? Is there a difference? Q. How can I place an order? A. You can place an order 3 ways. Via Online at www.musicboxattic.com, by calling us at (866)622-8842 or email us and we will send you a Pay Pal money request and an order confirmation. Q. How can I find out the status of my order? A. We ship out non-custom orders same or the next business day. Q. How long until my order is shipped out? A. We ship out non-custom orders same or the next business day. Q. How long does it take for me to receive my order if I reside with the US? A. We ship out of Los Angeles, CA. Depending on the shipping method you choose it can be anywhere from 1 to 5 business days. Click here for exact time frame. Q. What shipping choices do I have? A. Please Click here to see your choices for both domestic and international orders. Q. Do you ship internationally? A. Yes, please Click here to see your shipping options with estimated time frames and costs. Q. How can I track my order? A. You can follow your orders transit after it has shipped from our warehouse. As soon as it ships you will receive an email with the tracking number letting you know that your order has shipped and how you can keep track of it. Q. How can I find out the status of my order? A. Your order confirmation email has the link which you can click on anytime to view the status of your order. You can also contact us directly online via Chat, email at help@musicboxattic.com or by phone at (866)622-8842. Q. Can I make changes to my order? A. Yes, but contact us as soon as possible by phone at (866)622-8842. We will always accommodate any change granted that the order hasn't shipped. Q. There is a problem with my order, what should I do? A. Call us during business hours (9 - 5 PST/ M - F) by phone at (866)622-8842 for immediate resolution, or email us and we will get back to you within 24 hours. We will quickly get a replacement out to you that same day. Q. What if I need to cancel or return my order? A. To cancel your order, please contact us immediately via email, if available by chat or by phone at (866)622-8842. If your order has shipped, simply refuse the delivery or return the package to the address located on the original shipping label. Click here for further details on our return policy. Q. What forms of payments do you accept? A. We accept most forms of payments through our website. We accept all major credit cards as well as Pay pal. You can even mail us a check, money order or cashier's check (contact us for mail payment details). Click here for further details other forms of accepted payments. Q. Do you take checks or money-orders? A. Yes, please Click here for further details on how to go about mail in payments. Q. Do you offer discounts on large quantity orders? A. Yes, we do offer discounted prices on multiple/bulk item orders. Please contact us at (866) 622-8842 for exact pricing. Q. Do you offer wholesale pricing? A. Not at this current time. However, we are looking at this venue for future consideration. Every situation is unique so please contact us at (866) 622-8842 to discuss your proposal. Q. Do you do consignments? A. Not at this current time. However, we are looking at this venue for future consideration. Check back with us for any updates. Q. What kind of music boxes do you carry? A. We carry a huge inventory of music boxes of different shapes and sizes, jewelry boxes, snow globes, and more. You�re sure to find a style fit for every occasion imagine. We have thousands of styles at any given moment available in stock to choose from. We also directly specialize in Handmade Sorrento boxes from Italy. You'll find a variety of wood inlays here. Q. Do you carry jewelry boxes? A. 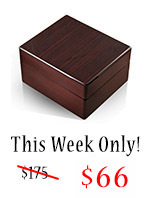 Yes, please Click here for selections of jewelry boxes with or without music. Q. What's the difference between a music box and a jewelry box? A. There's usually not a big distinction between the two. Our rule is that if the "music box" provides any space (aside from the space for the musical movement) it can also be referred as a "music jewelry box". Although of course the main difference between a standard jewelry box and music jewelry box is one has music and the other does not. Q. How do I know what song goes in what box? A. The majority of our items (e.g. Sorrento boxes) requires that you select a song from a list of available tunes located the actual product page. Some items have preinstalled tunes and those will be the only songs for that particular item. Q. Do you make custom boxes? A. Yes, we are able to accommodate custom inlaid Sorrento boxes. Yes, we are able to accommodate custom inlaid Sorrento boxes as well as figurine style items, globes and other similar items that we sell on our website. We would need the design of the item, as well as any drawings, details and due dates first of all. For all other details please contact us to discuss the project further. Please note we do not make one single custom box, but if you are looking for custom music, we can do any song in any box within days. For details on pricing, please click here. Q. Why are some boxes so expensive? A. We have music boxes that range from $30 - $10,000. After a few hundred dollars, the price tends to increase as you incorporate higher note movements (music). The bigger, better the mechanical movement inside the box, the more expensive it is. Q. Why don't all the boxes have the same music available? A. For the majority of our music boxes are assembled in our facility in Los Angeles, CA. For that reason, different size movement can be installed and every movement size (e.g. 22 note, 30 note) has its own respective list of available songs. Q. Do you guys do gift wrapping? A. Yes we do. It is an optional service we provide for your convenience located on any product page under music selection. Q. Do you do any type of engraving? A. Yes we do offer engraving services. You can submit text in other languages or even a photograph. Please Click here to see all the options we have available. Q. Do you engrave on the box directly? A. Not at this current time. We do engravings on brass or silver plates. However, check back with us in the coming months to see our updated engraving services. Q. Can I see examples of the types of engravings? A. Please click here to see what an engraving looks like on one of our music boxes. Q. What types of songs do you have available? A. We have melodies from various genres of traditional tunes from Classical to children's Lullabies, Inspirational Gospel to pop. Q. Can I sort by the type of music? A. Not at the current time. We are working on implementing advance sorting features in the near future. Q. What do you mean by notes? A. 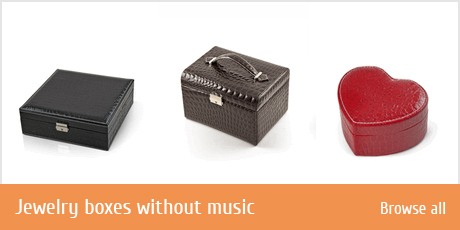 We can be here for a while, so instead click here to learn more about music box movements! Q. What is the difference between and 18 and 30 note? A. It's probably best to click here get a visual and auditory explanation to answer your question. Q. Can any music box have any size note inside? A. As long as the music box has enough space for the musical movement, we should be able to accommodate your request. On the website you will find many boxes with just one option for the movement size, that is because it doesn't have a large enough compartment to fit a bigger size movement. Q. If I have my own box, can I send it to you to put the music in? A. Yes you can but before you do, please contact us by email at help@musicboxattic.com or by phone at (866)622-8842. This is just to ensure that your box is evaluated prior to sending it to us. Q. Do you have a catalog you can mail out? A. Unfortunately, we are unable to provide a printed catalog at this time. Our products and inventory count are constantly changing and the only way to see what we have available in real time is by looking at our website. We might have a print catalog in the future, check back with us from time to time. Q. Do you offer any coupon codes? A. Yes, the best way to get our best coupons is to sign up for our newsletter where from time to time we might offer a coupon up to 25% off. But, if you sign up right now, you will immediately get a 10% off coupon just for signing up today. Click here to sign up for our newsletter and receive immediate savings. Q. Do you repair music boxes? A. 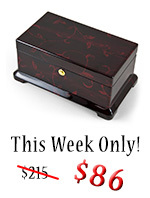 Yes, but only for a certain range of music boxes. We mainly do repairs on larger size Swiss mechanical movement inside a music box and not the music box itself. However, if the box is in need of small repairs we will try to accommodate such work as best as we can. Please contact us by email at help@musicboxattic.com or by phone at (866)622-8842 for further details. Q. Do you off any guarantees or warranties? Is there a difference? A. Yes, we provide you with an unmatched 100% no questions asked 1 year/365 guarantee or exchange policy. At any time within a year after your purchase you can return (check return policy) or exchange your music box if you wish. After the year goes by you are able to add to your order a lifetime warranty for just a few bucks at checkout which covers pretty much everything you can think of. Your purchase with us will be hassle free and our after purchase offers are the best you'll come across. Q. Can I get any song not on your list? A. Yes, we can incorporate any sound, song, recording or any file you provide or even a simple link from YouTube. We do this through our unique custom digital module. The music box will play back the original version of the song, an instrumental, a unique version you might have or we can even convert the song to play just like a mechanical music box movement. Please click here here for further details on custom tune creating. Q. What type of music can the digital module play? A. The digital module can pretty much play anything that can be recorded. From your child's recital, a personal message you recorded for someone or a song you heard before. Regarding ideal file types, any file format will work as it will always be converted down to an mp3 format. Q. Do you make custom mechanical movements? A. We do offer the ability to facilitate having a custom mechanical movement created for you. To see how the process works, please see here. Q. What does a conversion or converted tune mean? A. Within the digital module option, you can choose to have your recorded file �converted� to sound like a music box. This is an optional, paid service. Q. Should I choose the extra $75 option if my song is already in music box format? A. No. Submitting a previously converted melody will save you money and speed up the delivery time frame. Q. How do I send the sound file to you? A. You can submit the sound file a few ways. If ordering online, you can upload it directly on the product page. You can email the file to us directly at help@musicboxattic.com (referencing the order number is you have one), provide a link to the source file or simply provide the details verbally during the order process if placing the order by phone.